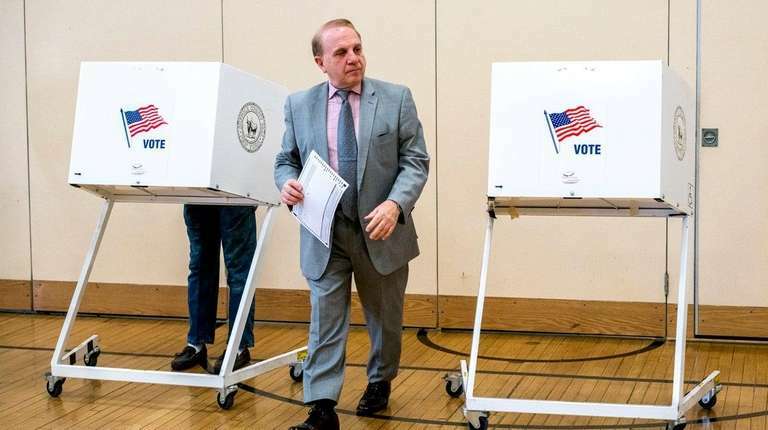 Proposed budgets totaling nearly $13B were on the line and 200-plus candidates vied in contested races in 56 systems in Nassau and Suffolk. School budgets passed overwhelmingly Tuesday in districts across Long Island, but Uniondale’s spending plan failed to a win a majority and a split among North Bellmore residents over the issue of student busing led to a jarring defeat there. As counting of ballots continued, 122 of the 124 school systems in Nassau and Suffolk counties reported approvals of their 2018-19 budgets. The North Bellmore spending plan’s defeat came with the failure to amass the supermajority needed for passage. That was driven not by the district’s budget, but by costs of transportation-related propositions on the ballot that pushed the system past its tax-cap limit. North Bellmore’s $57.2-million budget actually won support from a small majority — 1,322 to 1,231. But the 51.8 majority fell far short of the 60 percent needed to exceed the district’s state-imposed cap. “I would have expected a bit more than that,” said Mark Schissler, the district’s assistant superintendent for business, who added that majority votes in recent years have often exceeded 60 percent. Schissler said the district would hold a revote in June, and that the board would meet next week — probably on Tuesday — to work out details. In Uniondale, the budget required a simple majority for passage. It drew 847 “yes” votes, to 1,009 “no” votes. Many early returns were from tiny systems on the East End. Bigger districts to the west that approved budgets included Bayport-Blue Point, Bay Shore, Plainview-Old Bethpage, South Country and William Floyd. “It looks as though the overwhelming majority of budgets on Long Island will pass, and I’m seeing many pass by substantial margins,” said Lorraine Deller, executive director of the Nassau-Suffolk School Boards Association. While Greenport was the only system on the Island seeking a cap override this year, two parent groups in the North Bellmore district petitioned for expanded student bus transportation that would push taxation beyond the allowed limit there. Those petitions resulted in an unusually complex ballot that gave voters four options on student transportation: to expand busing for students attending local public schools, to expand busing for those attending out-of-district private schools, to reduce busing or to leave busing at current levels. The complexity had some residents worried as they went to the polls that voters would split and not muster the 60 percent majority needed to pass the district’s proposed budget. “It was so complicated to read. I looked at it and said, ‘Oh my God, it’s so complicated! 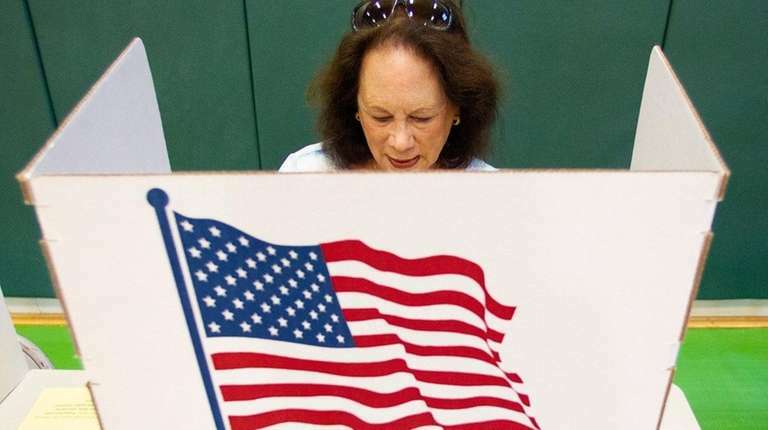 I wonder if it’s going to mess things up,’ ” said Rita Stiller, a retired teacher, as she emerged from voting at the district’s Newbridge Road Elementary School. Voters in Greenport — the only district to attempt a tax-cap override this year — endorsed the district’s $19 million spending plan 243-133. The 64.6 percent majority topped the 60 percent approval required under state law for the system to raise property taxes in 2018-19 beyond Albany’s prescribed limit. Spending plans that are within a system’s tax-cap limit require a simple majority of those voting to pass. Greenport projects a 4.62 percent tax hike next year — well beyond its 2.62 percent cap — and this is the third time in six years that the village-sized district has succeeded in an override. Local school authorities earlier this year described the latest override as the only way to meet rising costs of school security and other priorities without cutting programs in popular areas such as prekindergarten. Greenport and other East End districts have had more success busting caps than districts to the west, reflecting the fact that taxes in the eastern region are lower. The results also showed a familiar pattern with majorities that were lopsided in favor of budgets but represented a small portion of district residents. For example, Greenport’s total vote of 376 was well below the district’s 645-student enrollment. This year’s school votes featured $12.8 billion in proposed spending Islandwide, along with contested board races with a total of 207 candidates in 56 districts. Islandwide, proposed spending plans showed an average 2.85 percent increase for the coming academic year, with tax collections rising an average 2.37 percent, to $8.7 billion. Those were the highest increases in five years and reflected a rising inflation rate, upon which the state cap limits are based. State aid pays for most costs not covered by local property taxes. School taxes account for more than 60 percent of homeowners’ assessment bills in a region where such bills consistently rank among the nation’s highest. Some public school leaders had hoped that last year’s universal approval of budgets Islandwide — a first-time occurrence since same-day voting began in the mid-1990s — but it was not to be on Tuesday. Education finance experts agreed that a major factor in the growing number of budget approvals has been the state’s imposition of tax-cap restrictions, which first took effect during the 2012-13 school year. The caps have proved popular with voters, because they limit annual increases in local school property taxes. A total of 56 school systems in the region had proposed expanding programs, staffs or both — sometimes in a major way. For instance, a ballot proposition in Massapequa sought approval to allot $15.3 million for an aquatic center at Berner Middle School. It was voted down overwhelmingly. Eighteen districts planned reductions — among them, Eastport-South Manor, which had projected the loss of more than 70 staff positions to avoid running into the red. Another 35 districts said current staff and programs would be maintained. Voters in Eastport-South Manor had mixed reactions Tuesday to the proposed $93.5 million budget,with some saying they were upset by tax increases of recent years — and the prospect now of up to 75 employee layoffs, including 22 teachers. The spending plan passed 1,096 to 388. He said he voted for the budget — his children attend local schools — but is exasperated by the tax increases. Jill Richer, 47, said she voted for the budget, largely because her three children went through the Eastport-South Manor system, got a good education and now want to be teachers. Richer said she wants to give current students the same opportunities her children had. “We are coming to support the younger generation,” she said, noting that the budget increase would be less than 1 percent. Read the Uniondale school district superintendent’s letterRELATED STORY: School budgets pass across LI, but two districts suffer loss Teen disciplined for walkout loses school raceGabrielle Anzalone said her candidacy was not prompted by her district's decision to punish her and other students but to better represent student voices in public education. 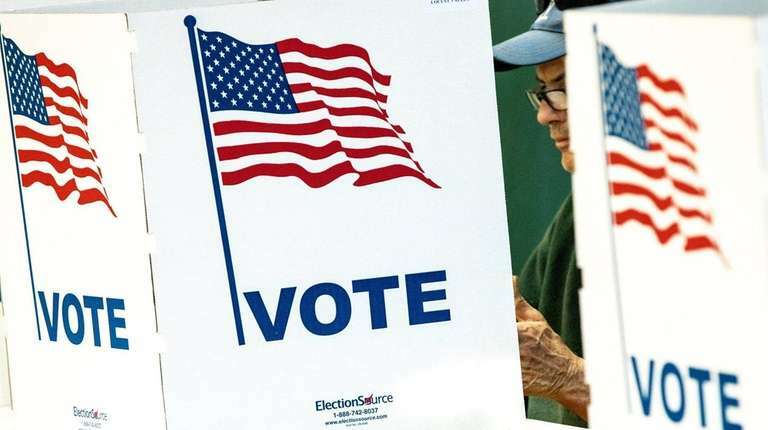 Incumbents voted out in Hempstead schoolsHempstead voters Tuesday approved an approximately $215 million budget and a $46.8 million bond issue, ... See school budget, board vote resultsFind out how your school district voted in its school board election and budget vote.